You’re going out on a vacation but have some important time-sensitive messages to send. The place you are going to might not have any internet connection at all. You can simply schedule WhatsApp messages and go off to the vacation you’ve been planning for months. If your business requires you to send messages to your clients on a timely basis, you can schedule them in the morning and you won’t have to look at them again. You can schedule WhatsApp messages on Android and iPhone mobile phones using third party apps. These apps are very simple. All your have to do is download the app on your phone. It will automatically sync with your WhatsApp application. Search the name of the person you want to send scheduled WhatsApp messages and select the time and date. If you are looking to schedule WhatsApp messages on Android, you need to look for the right app. With it, you can send messages whenever you want to, even if you are asleep. Sounds exciting, doesn’t it? 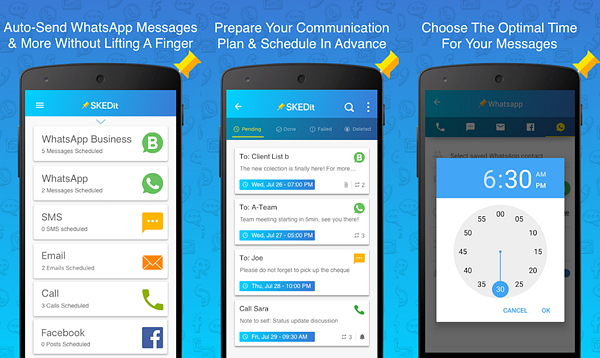 SKEDit Scheduling App is a free 5-in-1 scheduler, which you can use to schedule WhatsApp messages, Facebook posts, calls, emails, and SMS messages. If you are a social influencer, you should definitely have this app on your mobile phone. It not only saves time, but also takes away the stress and makes you more productive. The automated communication technique keeps you right on track with the tasks you have scheduled to perform that particular day. Step 1. Install and sign-up using your contact details or One-Touch Facebook register. Step 2. Choose the communication mode you want to automate. In this case, it will be WhatsApp messages. Step 3. Choose the person you want to send the message to. Write the message you want to schedule to be sent later automatically. Step 4. Select time and date for sending the message content. Your job is done. Forget about it and move on to the next task. 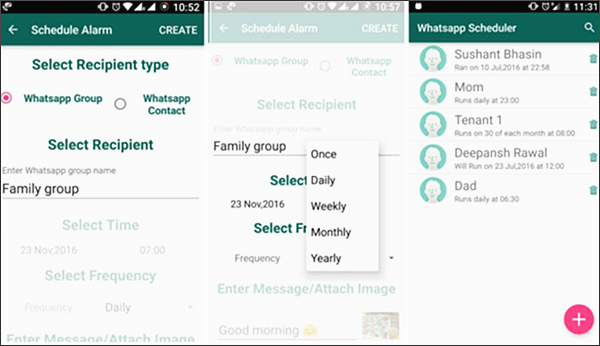 Scheduler for WhatsApp is easy to install and use. Apart from scheduling WhatsApp messages, you can schedule emails as well. This app offers more features than the earlier one as you can create groups and send a scheduled text accordingly. After you configure your email ID with the app, it will automatically send emails from that ID without asking over and over again. You can change the ID any time you want. Step 1. 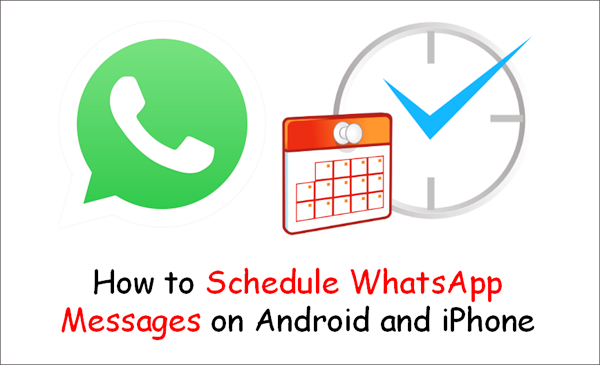 Download Scheduler for WhatsApp on your Android mobile phone. Step 2. Sign up and enable Accessibility. Step 3. Tap on WhatsApp and click +. Step 4. Select recipient, time, and frequency of the WhatsApp message. Type the message you want to schedule. After the message is scheduled, you’ll be able to view it every time you open the app on your mobile phone. 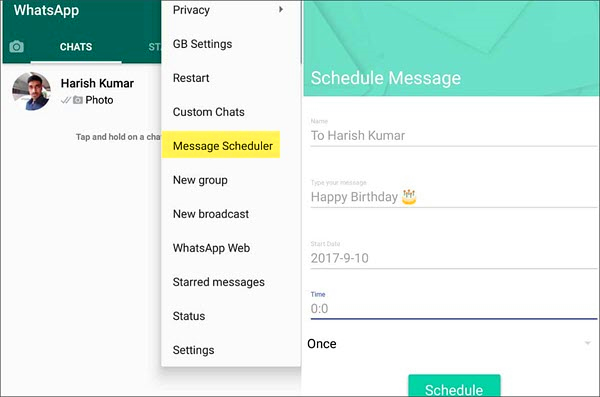 One of the best apps you’ll ever find for scheduling WhatsApp messages on Android phones, GB WhatsApp is completely free and offers a lot of features to make your experience a pleasant one. After you download the GB WhatsApp apk, you don’t need to root it. Rooting is not safe because it can harm your phone’s basic functioning and render it useless. We personally recommend this app because it does a lot more than just schedule WhatsApp messages. You can delete messages that you’ve already sent, run two WhatsApp accounts in one phone, hide your status for privacy and safety reasons, use special emojis that are not available to other WhatsApp users, and make video calls without any trouble. You can keep a group name up to 35 characters using GB WhatsApp. Also, you can videos of up to 50 MB size using the app. Otherwise, you can only send videos of 25 MB size using WhatsApp. Messages can be broadcast to a maximum of 600 people at a time. Step 1. Download the latest version of GB WhatsApp on your mobile phone. Step 2. Install it like you install all other apps from Google Play. To find the downloaded app, open file explorer. Step 3. Enter your details like you do on WhatsApp and start using it. Step 4. To schedule a message, click on a contact and type the message. Set time and date and you’re done. You can also schedule WhatsApp message on iPhone mobiles. Here are two apps that we personally recommend and how to use them. Don’t own an Android phone? Don’t worry. Here is how you can schedule WhatsApp messages even if you own an iPhone. As you shall see, it is both easy and fun! A smart and innovative concept, Scheduled App can be used to schedule messages and posts on Facebook Messenger, Line, WhatsApp, Twitter, Slack, Telegram, LinkedIn, WeChat, Skype and iMessage. You can schedule and send messages to multiple people at once. It is a great app for businessmen and social media influencers who need to send continuous posts and messages to their clients and followers respectively. Step 1. Download and install the Scheduled App. Tap on schedule messages. Step 2. Select WhatsApp and person to whom you want to send the message. Step 3. Type the message and select time and date. You can send the message to multiple people at once. 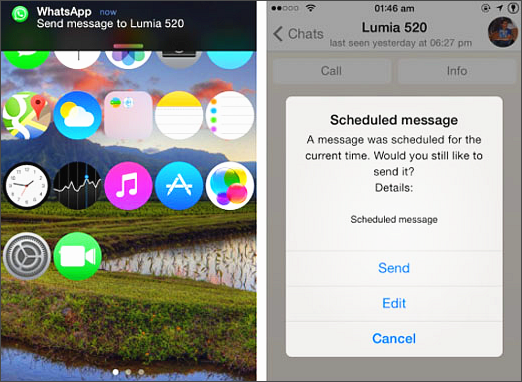 To use Message Scheduler for WhatsApp on your iPhone, you’ll have to jailbreak it. The app is pretty simple to use and works only for WhatsApp. 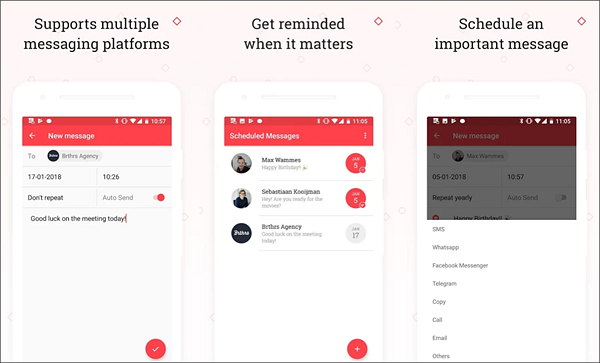 It is the perfect match if you are looking for an organizer for your WhatsApp messages instead of a big app like the previous one that offers support to various messaging and social media applications. Step 1. After downloading and installing the app, select schedule a message. Step 2. Type the message that you want to schedule and send to your contacts. You can select multiple contacts at a time. Step 3. Select time and date. This isn’t a free app and costs $0.99 yearly. WhatsApp is one of our most used instant messaging tools. In addition to knowing how to schedule text messages, you may also want to know what to do if some important chats are accidentally deleted or lost for some reason. Here, we recommend a data recovery master – Gihosoft Free Android Data Recovery, which is mainly used to recover lost data in Android phones, such as contacts, text messages, call records, photos, videos, WhatsApp chats and so on. 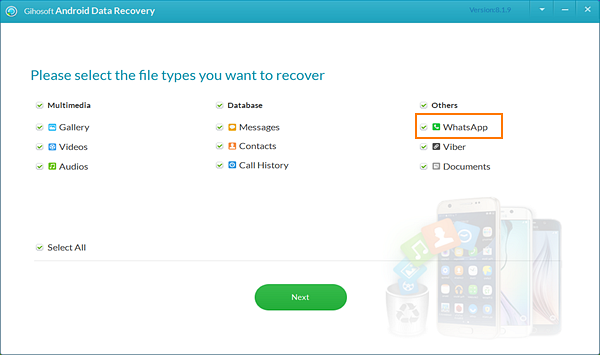 No matter what brand of Android phone you use, you can use this software to restore deleted WhatsApp chat history, including pictures, videos, audio, attachments, etc., in just a few steps. All five apps mentioned in this article are easy to use and equally good. They are very different from one another and we intentionally selected them because everyone’s needs are varied from each other. Our favorite app for Android users was Scheduler for WhatsApp and for iPhone users was Scheduled App. The user-friendly design and easy to navigate functions make scheduling WhatsApp messages so simple. It gives you time to do so much more because once the messages are scheduled, you don’t need to look at them unless absolutely necessary.